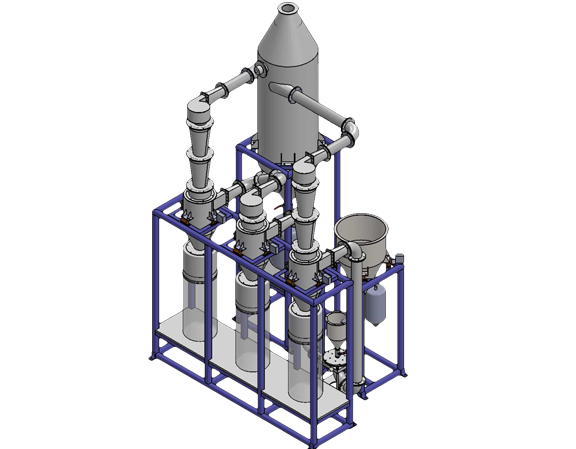 The project of the plant «TITAN +» for the production of micro and nano powders of cermets, carbides and metal oxides and their mixtures with a capacity of 2,000 tons per year. The company has introduced industrial methods of grinding various materials — from superhard to biomass — and developed effective technologies for mechanochemical activation of micro- and nanopowders, the creation of new mixtures and composites with new properties and a number of new materials. At present, the plant of metal micropowders Titan + is designed, the products of which are intended for powder, laser and plasma metallurgy. The first plant will be launched in Switzerland. The plant can be multiplied in other countries. The project «Titan +» is based on the developed new technology of vortex gas-dynamic one-stage grinding of materials and separation, which has no analogues in the world in terms of efficiency. The main energy source of the Tornado is compressed gas. multi-component micropowders with specified properties, etc. The plant «Titan +» covers a wide range of highly scarce and expensive micro and nano powders for laser (industrial 3D printers), powder and plasma metallurgy. A distinctive feature of the plant is superhard materials — a group of substances with the highest hardness, which include materials whose hardness and wear resistance exceeds the hardness and wear resistance of hard alloys based on tungsten and titanium carbides with a cobalt binder of carbidotitanium alloys on a nickel-molybdenum bond. Widely used superhard materials: electrocorundum, zirconium oxide, silicon carbide, boron carbide, borazon, rhenium diboride, diamond. In recent years, the close attention of modern industry has been directed to the search for new types of superhard materials and the assimilation of such materials as carbon nitride, boron-carbon-silicon mixture, silicon nitride, titanium carbide-scandium carbide mixture, borides and carbides mixture of titanium subgroup with carbides and borides lanthanides. By the technology of «Tornado» new nanostructured metals, alloys and ceramics have been created, which have increased strength and other important properties — wear resistance, magnetic «softness», nonlinear optical and dielectric characteristics, heat resistance and corrosion resistance. Areas of application are various reinforcing coatings, aerospace industry, precision machining tools, electrical engineering, radio electronics, optics and lighting technology, implants for medicine.